Microsoft listens to its users. 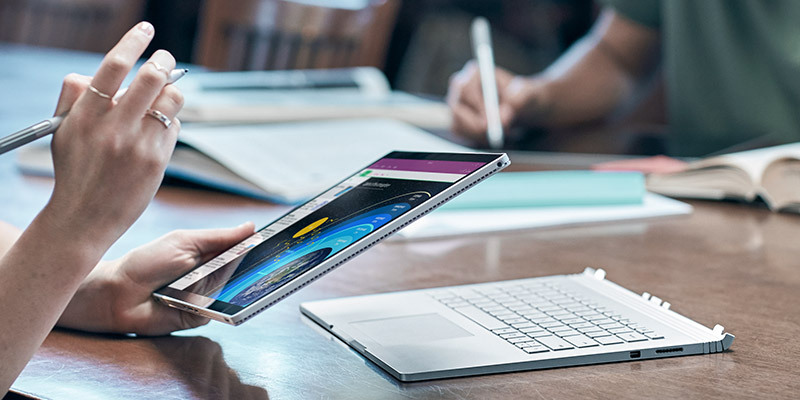 The next generation Surface Book is here with more powerful hardware and longer battery life. The design remains the same as previous versions except that the space between the screen and the keyboard has been reduced somewhat when the laptop is folded. Microsoft’s big event on October the 26th comprised of many important launches such as Surface Studio AIO and the Windows 10 Creators update. The next generation Surface Books didn’t draw as much attention. So what’s new in the next generation? Microsoft has mainly improved the processor and the graphics card based upon user feedback following the launch of the Surface Book at the beginning of the year. An Intel Core i7 “Skylake” 6th generation processor powers Surface Book. The latest Kaby Lake processor might be introduced in the future, but that’s something that Microsoft hasn’t announced. The cheaper entry model has 8 GB of RAM and 256 GB of storage. The more powerful models offer 16 GB of RAM with 512 GB or 1 TB of storage. The graphics card has been upgraded to Nvidia Geforce GTX 965M. This is not the latest version of Nvidia’s graphics card, but still, a noticeable improvement compared to previous models that employed a built-in graphics circuit in the Intel processor. Surface Book users will certainly enjoy the improved graphics performance! The display is the same as that found on existing Surface Books. This means a 13.5-inch sized PixelSense touchscreen with a resolution of 3,000 x 2,000 pixels. This yields a pixel density of 267 pixels per inch (ppi), which is identical to Surface Pro 4. The aspect ratio remains unchanged at 3:2. The battery life has increased from 12 hours to 16 hours due to improved cooling and a larger battery. The larger battery has caused the weight of the laptop to increase from 1.56 kg to 1.63 kg. Most laptop manufacturers reduce the weight for new models that they bring to market, so it’s surprising to learn that Microsoft bucks the trend in this respect.